The early morning sun is just beginning to appear as a hazy disk through the blanket of fog as we make our way along the beach. To our right, visible only in eerie glimpses through the tendrils of mist, marches an endless line of dunes. To our left, the ocean murmurs against the sand of the beach. Today, for once, the wind is calm and the ocean is lazy – as is everything else on the beach. No cries come from the terns and gulls I know are somewhere above, circling in the fog. Even the occasional clumps of seals are silent and still; only a few lift their heads sleepily as we pass. Life as a field biologist often means redefining common experiences. For two amazing summers, my morning commute involved motoring along the beaches of Sable Island at 24 km/h, smelling the salt of the ocean and hearing only the cries of nesting gulls and terns. The only other commuters to worry about were the seals (which are admittedly quite bad-tempered in the morning…and at most other times) and the occasional curious wild horse. Before moving from Ontario to Nova Scotia to pursue a graduate degree at Dalhousie University, I had never heard of Sable Island. 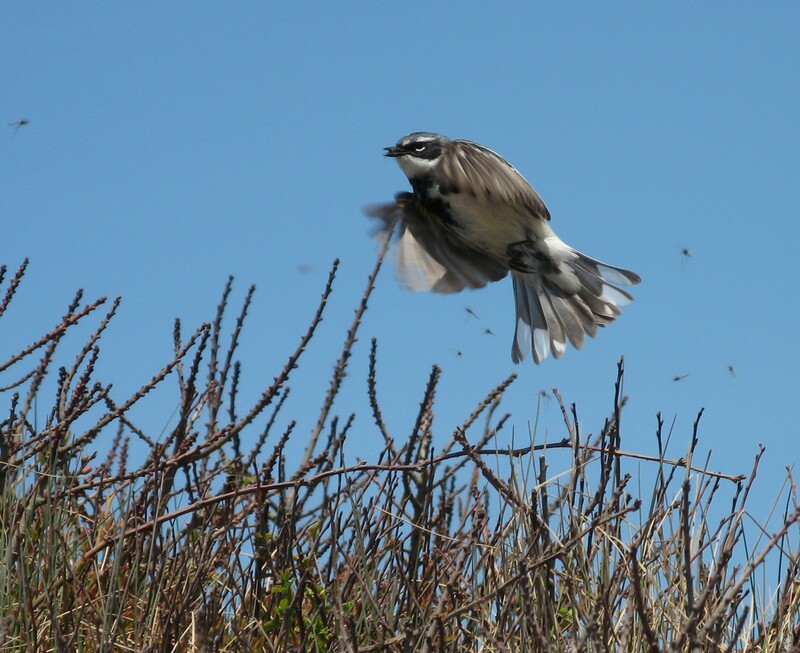 In fact, when I started at Dal, my intention was to study a box nesting population of Tree Swallows in a nearby rural community. But shortly after arriving in Halifax, I began to hear stories about a remote and mysterious island of sand, almost impossible to get to but well worth the effort – iconic Sable Island, a source of fascination for many Nova Scotians. An Ipswich Sparrow surveys his territory. So I did the only logical thing: I changed my project (much to my supervisor’s dismay). I decided that I wanted to study Ipswich Sparrows, a subspecies of the widespread Savannah Sparrow that nests only on the dunes of Sable Island. Luckily for me, their narrow breeding distribution and wide wintering distribution make Ipswich Sparrows a perfect species with which to study the connections between migration distance and reproductive success – which gave me an amazing opportunity to get to know a part of Canada that few ever get to experience. 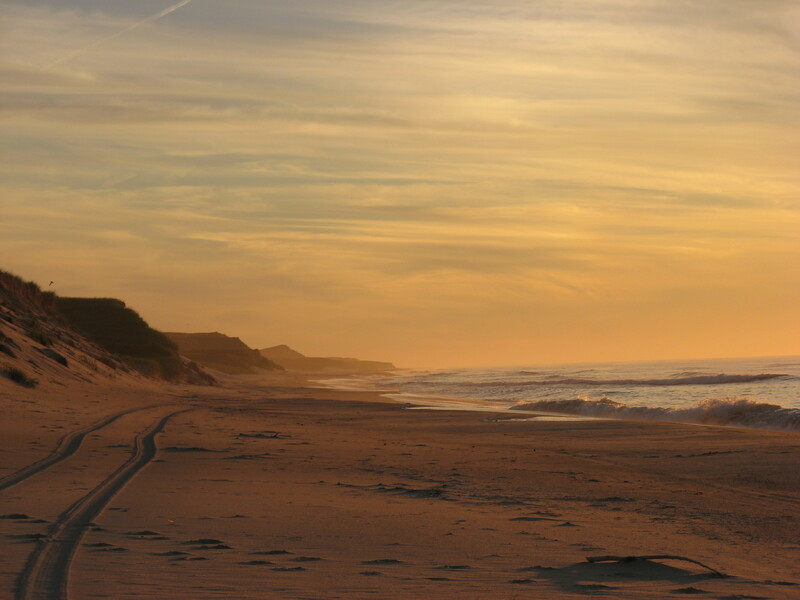 From the moment I set foot on Sable’s isolated beaches, I was enchanted. Sable is an island of improbabilities. A thin crescent of sand only 1.5 km wide at its widest point, it is nothing more than a pile of glacial till lying in the northwest Atlantic Ocean, poised at the edge of the continental shelf. The island is defined by a curving backbone of vegetated dunes, approximately 45 km long, bordered to the north and south by low-lying beaches. 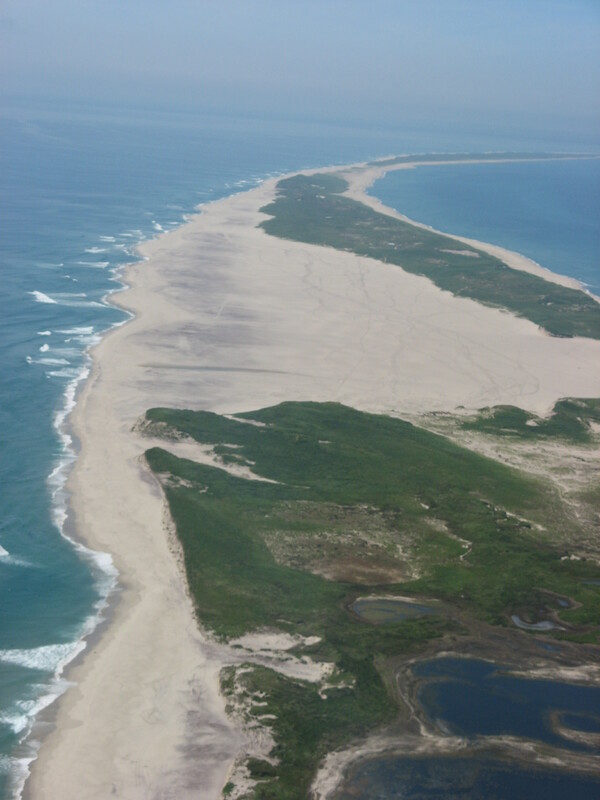 Sable Island from the air. Getting there proved extremely difficult – both summers I worked there, we had to wait almost two weeks after our intended departure date for the weather to cooperate. Each year, when we finally stood on the beach with our gear, watching the departing plane, it was only too easy to remember that we were 200 km from any other land, perched precariously on a sliver of sand clinging to the edge of the continental shelf. The layer of fog that frequently shrouds the island (one year, Sable was fogged in for 61 days straight, from the beginning of June to the end of July) only emphasized our disconnect with the rest of the world. This somewhat eerie atmosphere is enhanced by Sable’s reputation as the “Graveyard of the Atlantic”. Over the past 500 years, more than 350 ships, both large and small, have run afoul of the island’s hidden dangers. Several factors make Sable one of the most perilous places in the Atlantic. Like an iceberg, the majority of the island lies hidden under water, where shallow sandbars stretch for miles. Even those parts that lie above the water’s surface are difficult to see – the tallest dune rises only 25 m above sea level. And just to add to the problem, Sable refuses to stay in one place: as ocean currents sweep sand from the west end and add it to the east end, the whole island is actually migrating eastward. In fact, shipwrecks are often credited for the arrival of the island’s most famous inhabitants: the wild horses. They roam the island’s dunes, organized into herds of about 50, each under the control of a dominant stallion. Romantic legend has it that they are descended from the equine survivors of a shipwreck, although the more accepted (and more prosaic) story is that they were intentionally released on the island during the 1700s. Regardless of their origin, there is undoubtedly something magical about watching them wandering through the dunes and cantering along the edges of the freshwater ponds. And while it is forbidden for visitors to approach the horses, we quickly found out that they follow no such rules: despite our best efforts, they often approached us! “What do those things do?” This guy was very interested in my binoculars. A Myrtle Warbler forages over a low-lying bush. In fact, all kinds of interesting things wash up on Sable’s beaches – from messages in bottles to hapless migratory birds blown off course by storms. These disoriented migrants are quite naturally confused to find themselves in a place with no trees, and will often perch on any available substrate. One afternoon in the field, I was astounded when a Myrtle Warbler, which had been foraging over a nearby bush, decided he needed a rest – and landed on the toe of my boot to take it. I was lucky enough to spend two field seasons on Sable Island – just enough time to get to know it, but more than enough time to come to love it. Leaving at the end of my second season was incredibly difficult, particularly because the island’s inaccessibility will makes returning unlikely. In the years since I worked there, I’ve realized that Sable is the kind of place that sticks with you – both physically (more than a year after leaving the island, I was still finding grains of sand in my hiking boots) and mentally. Sable Island is a persistent improbability, a geological oddity…and most of all, a place where it is easy to believe in magic. 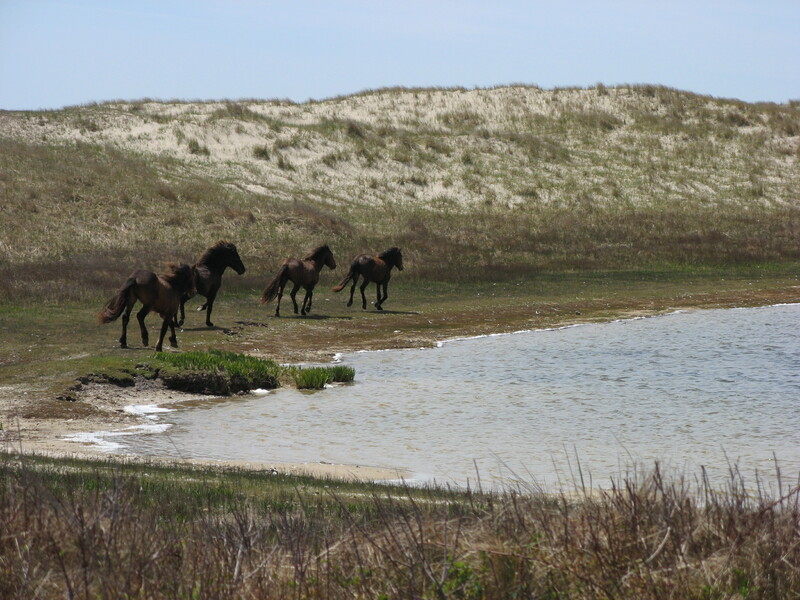 To learn more about Sable Island, check out The Sable Island Green Horse Society website. 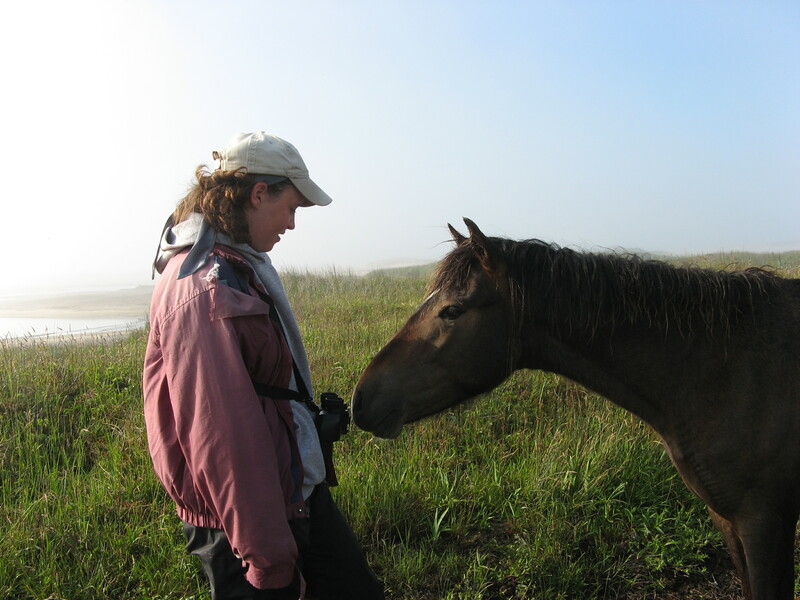 Loved your post from Nov 10th about your time on Sable Island! Thanks for sharing your experiences there in this informative and entertaining blog. So few people have the opportunity to see this special place that it is important that those who do visit help educate others as they are able. In that spirit, would it be possible to provide the date for your time there to set the context for readers to better understand the changes that have occurred since your visit, such as: Sable Island is now a Canadian National Park Reserve and managed by Parks Canada; you are no longer permitted to approach the horses or allow them to approach you in the way you captured in your photo; ongoing research and monitoring of the Ipswich Sparrows will be important for Parks Canada as they develop their management plan for Sable Island National Park Reserve. 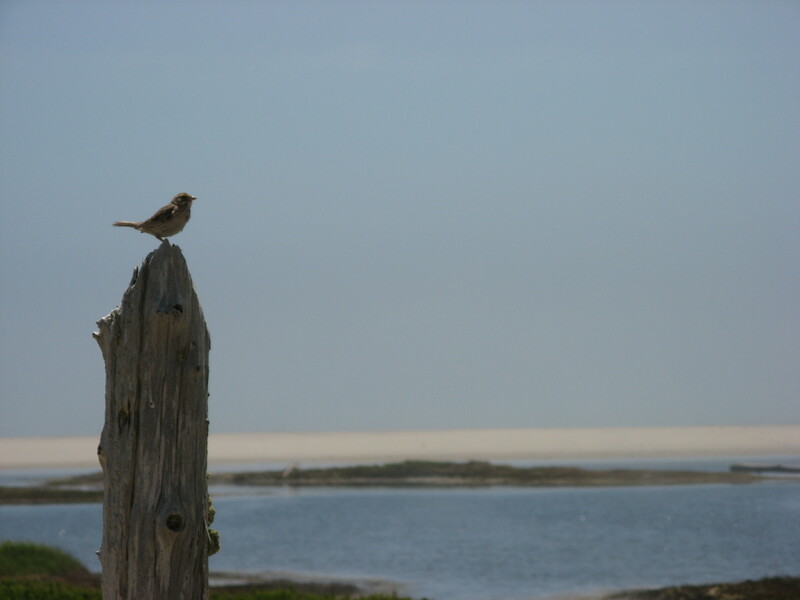 Thanks for your research work on the Ipswich Sparrows, an important piece of what makes Sable Island so unique and worth protecting. Thanks for your comments, April! It’s definitely true that many things have changed on Sable since I was there in the summers of 2006 and 2007 – perhaps most notably, as you say, the island became a National Park Reserve in 2013. That being said, approaching the horses was not allowed even when I was there. However, we found that it was very difficult to not allow them to approach us, especially when we were tied to a particular place and couldn’t just move – for example, if we had set up a mist net to catch birds. In fact, the photo in my post was taken as we were in the middle of banding Ipswich Sparrow nestlings. We tried several times to get out of the horse’s way, but he was very persistent! Hi Catherine: Not sure if you were aware of the “Science and History of Sable Island” conference we’re planning for May 1-2, 2015. For more information, please see sableislandfriends.ca and click on the “Sable Island Conference 2015” tab. Please consider submitting an abstract and/or notifying others of the Call for Abstracts – new deadline of Friday January 2, 2015. Hi April – No, I wasn’t aware of the conference but it sounds great. Thanks for letting me know! I’ll certainly pass the information on! Hi Catherine, We are working on a film about the Grey Seals on Sable working with Nell den Meyer (DFO) and Damian Lidgard(Dal) We are hoping to do a spring summer sequence and would like to film the Ipswich Sparrow and Arctic Terns(Hopefully with the help of Parks) Do you know of any researchers in Nova Scotia who are working with these species? Enjoy your blog, over the years I have had the opportunity to meet a number of field biologists. I have always been impressed with their adventures and their generosity. Please keep up your great work and thank you for sharing it with us! Hi Kent – that sounds like a very interesting project! Off the top of my head, I don’t know who in Nova Scotia is currently working with the terns and Ipswich Sparrows, but I’d be happy to ask around for you if that would be helpful. Glad you enjoy the blog. Thanks for reading! And if you are ever interested in writing a post about your adventures while making your film, you’d be most welcome!